Metal Power info about the game-Games2Rule. 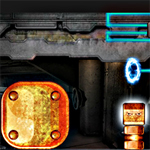 Metal Power is a fun physics game, your goal is to get the glowing block to the power source. Click on the copper objects to shrink and enlarge them.